Perhaps the biggest surprise in Week 1 of the current NFL regular season was the record-breaking performance of the Carolina Panthers’ rookie quarterback Cam Newton. 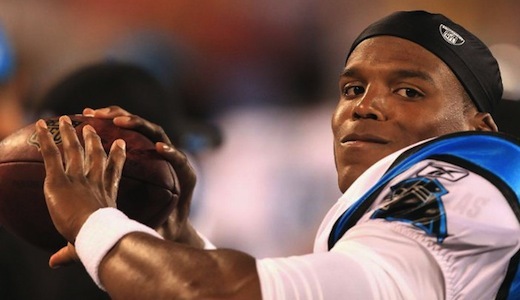 There is no question that taking Newton with the number one overall pick in the 2011 NFL draft was a no-brainer as he was without a doubt the most talented athlete available, but there was a lot of uncertainty surrounding the rookie gunslinger heading into Week 1 against the Arizona Cardinals. Against the Cardinals, Newton put on a show with an NFL record 422 passing yards and three total touchdowns (two passing, one rushing). This performance turned a lot of heads as many people believed that he would be a quarterback that would hurt opposing defenses more with his legs rather than his arm much like Michael Vick when he was playing with the Atlanta Falcons. Ironically enough, it has been the complete opposite thus far and as a result Cam Newton looks like the league’s newest superstar quarterback. The Panthers selected Newton because he was the best available player and the new kind of hybrid quarterback that seems to flourish on the NFL level. Despite having a big upside with a potentially bright future in the NFL, no one expected much from the rookie in his first NFL start or even in his first full NFL season under center, but he has majorly exceeded expectations thus far with two brilliant performances in consecutive weeks to start his NFL career. In Week 2, Cam Newton and company had to square off against the defending Super Bowl champion Green Bay Packers and the consensus was that the rookie quarterback would be put in his place against one of the best defenses in the league. That didn’t turn out to be the case as Newton threw for over 400+ passing yards for the second straight week and made people believe that last week was no fluke. The Carolina Panthers still lost to the Green Bay Packers (30-23), but it was a show from start to finish with Cam Newton throwing for 485 total yards (432 passing, 53 rushing) and two touchdowns (one passing, one rushing). The rookie did get picked off three times in this one, but he single-handedly made this a competitive game and showed some promise for the future. Not only does it look like Cam Newton has won the Offensive Rookie of the Year award in just his first two games in the NFL, but he also looks like he might be able to turn around the struggling NFL franchise and make the Carolina Panthers legitimate playoff contenders in the near future. It would be safe to say that the Carolina Panthers are the best 0-2 team in the league, but the reality remains the same that this team will miss the playoffs and needs more pieces to the puzzle in order to compete in the NFC Conference.